The first generation flight of corn earworm moths continues throughout the state. Heaviest populations as evidenced by pheromone trap catches have been in the northwest. This first generation flight should be ending soon. Then we will likely have a lull in catches for a while (several weeks) until the second generation emerges or we get a migratory flight from the southern US. To check moth catches in your area, please visit https://extension.entm.purdue.edu/cornearworm/index_doc.html. Remember that sweet corn that silks prior to silking in the dent corn near your sweet corn field is much more vulnerable to egg laying from the moths. That’s why we recommend spraying if your sweet corn is silking and you catch any moths in your trap. Once the neighboring dent corn begins silking, that corn will be just as attractive to moths for laying eggs as your sweet corn, so the amount of egg laying is diluted. As a result, during this period of time, we recommend that you don’t spray unless your sweet corn is silking and you are catching at least 10 moths per night in the trap. The timing of dent corn silking often coincides with the interval between generations of corn earworms when moth catches are quite low, often zero. This period of time is a great opportunity for growers to save the money and time that they would normally spend spraying their sweet corn since moth catches are low and sweet corn is less vulnerable to attack. Later, after dent corn pollination has been completed, sweet corn will again become more attractive for egg laying, so we again reduce the spray threshold to 1 moth in the trap. This period of time usually coincides with either the emergence of the second generation or the arrival of migratory moths, often in very high numbers. 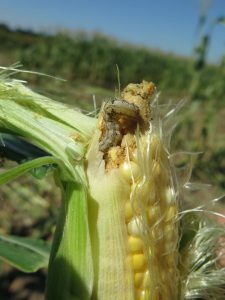 As a result, these plantings of corn are often severely attacked by earworms, so growers need to be very vigilant in their spray programs to avoid serious losses. Some growers are still using the pyrethroid insecticides for earworm control. If they work for you, that’s fine. However, in most areas, there is a significant level of resistance in earworm populations to those products, so growers have been forced to switch to other, more expensive, alternatives. Currently, Coragen® and Radiant® are the best options for management of earworms.